This utility works on any version of Windows - from Windows 98 to Windows 10. There is also a separated download for handling x64 registrations. 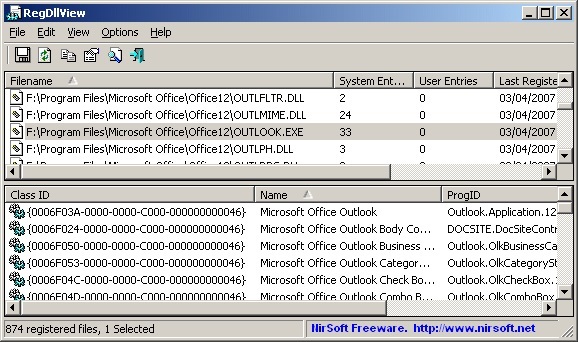 RegDllView doesn't require any installation process or additional DLLs. Just copy the executable file (RegDllView.exe) to any folder you like, and run it. If you want to view the files that registered in the last hours/days, simply click the 'Last Registered On' column, and the list will be sorted according to the registration date. If you want to find obsolete registrations on your system, simply click the 'Missing File' in order to sort the list by 'Missing File' status. You can unregister multiple dll files simply by selecting them in the upper pane, and then using the "Unregister Selected Files" option. However, this feature won't work on missing/corrupted files. The 'System Entries' column displays the number of COM entries under HKEY_LOCAL_MACHINE\Software\Classes\CLSID for the specified file. The 'User Entries' column displays the number of COM entries under HKEY_CURRENT_USER\Software\Classes\CLSID for the specified file. /stext <Filename> Save the list of registered dll files into a regular text file. /stab <Filename> Save the list of registered dll files into a tab-delimited text file. /scomma <Filename> Save the list of registered dll files into a comma-delimited text file (csv). /stabular <Filename> Save the list of registered dll files into a tabular text file. /shtml <Filename> Save the list of registered dll files into HTML file (Horizontal). /sverhtml <Filename> Save the list of registered dll files into HTML file (Vertical). /sxml <Filename> Save the list of registered dll files to XML file. /sort <column> This command-line option can be used with other save options for sorting by the desired column. If you don't specify this option, the list is sorted according to the last sort that you made from the user interface. The <column> parameter can specify the column index (0 for the first column, 1 for the second column, and so on) or the name of the column, like "Filename" and "Name Only". You can specify the '~' prefix character (e.g: "~Last Registered On") if you want to sort in descending order. You can put multiple /sort in the command-line if you want to sort by multiple columns. RegDllView.exe /shtml "f:\temp\regdll.html" /sort "Company" /sort "Filename"
A file named RegDllView_lng.ini will be created in the folder of RegDllView utility. After you finish the translation, Run RegDllView, and all translated strings will be loaded from the language file. If you want to run RegDllView without the translation, simply rename the language file, or move it to another folder. 4,463 6,509 Nir Sofer <img src="http://www.oldergeeks.com/downloads/gallery/thumbs/regdllview_th.png"border="0"> Jan 08, 2018 - 12:07 1.60 69KB ZIP , out of 9 Votes.